Bonnie Brown Heady. Wow. Where to begin? She was a short, fat prostitute with short auburn hair and a bubbly, engaging personality. She was attractive despite her weight and 5’1 height and was often complimented on her shapely legs. 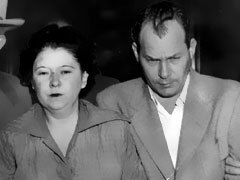 Her common law husband, Carl Austin Hall was the love of her life and she worried and fussed over him until the day they were executed side by side in Missouri’s gas chamber. She and Carl kidnapped and murdered young Bobby Greanlease from his Catholic school for a ransom. Carl had been dreaming of the crime for years before he’d met Bonnie. In his heart he felt it was the one last crime he would have to pull and he’d be set for life. He had thought about it for so long in fact, he was sure the plan was foolproof. Once he and Bonnie moved in together he enlisted her help. She posed as the boy’s aunt and told the nuns Bobby’s mother was ill and she had been sent to retrieve him. He was released to her with no trouble from six year old Bobby or the nuns. She took him straight to Carl and the three of them went deep into the countryside. On a side road Bonnie and Carl got out. Bonnie walked along the roadside while Carl spread a blue plastic sheet in the trunk and set about killing Bobby. He tried first to strangle him with a length of clothesline but it was too short. Instead, he shot him twice in the face. They buried the body and spent a few weeks drunk travelling from state to state. When they were finally arrested Carl expressed some remorse and talked of how badly alcohol had affected his life. Bonnie showed no remorse and remained her jovial, comical self. They were executed in two chairs side by side in the gas chamber. Bonnie and Carl were alone in the death chamber moments before their deaths. No one knows what was said but Carl died with Bonnie’s lipstick on his cheek.